Having collected an individual's responses to a DISC questionnaire, collated and calculated the results, the final outcome is a set of three graphs. Each of these three graphs (or 'profiles') describes a particular side to the candidate's approach. In combination, the set of three is known as a DISC 'profile series'. The three graphs of a DISC analysis all follow the same basic format, an example of which can be seen on the left. This graph format shows the levels of four different basic traits or factors; reading from left to right, these are Dominance, Influence, Steadiness and Compliance. 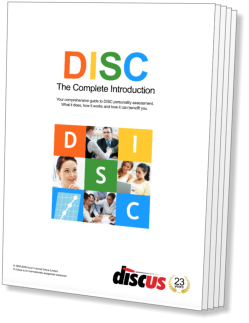 These are easy to remember, because their initials (D, I, S and C) are the reason that the DISC system is so named. 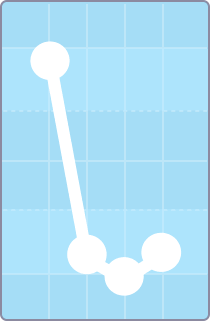 The four points on the graph are connected by lines to establish a recognisable 'shape' for a profile. With practice and experience, the shapes associated with common styles become easily distinguishable. The three graphs that make up a profile series might closely resemble one another, or diverge significantly, depending on the particular individual involved. Different DISC systems use different titles for each of the three, and their order can also vary from system to system. Nonetheless, the meaning and significance of each remains constant. This graph describes a person's 'inner' style, the type of behaviour that can be expected when they feel completely at ease. Conversely, this style can also sometimes be seen when certain people are placed under severe pressure, because such pressure limits their capacity to adapt their style. The Internal Profile tends to remain more constant over time than the other two graphs. Other names sometimes used for the Internal Profile include the 'Pressure' Profile and the 'Underlying' Profile. Very few people maintain the same approach regardless of circumstance; instead, they adapt to situations and others' requirements. The purpose of the External Profile is to describe the style of behaviour that an individual feels is appropriate to their current circumstances. The External Profile can change considerably over time, as a person's situation and environment changes - such modifications often accompany major life events, such as starting a new job or moving house. The External Profile is also known as the 'Work' Profile or the 'Mask' Profile. The Internal and External Profiles provide valuable information about a person's attitudes and perceptions. In reality, however, a person's behaviour is rarely based completely on one or the other of these styles. The Summary Profile combines information from the other two to present a view of a person's actual behaviour. Among the many variant titles of this profile are the 'Basic' Profile, the 'Composite' Profile and the 'Snapshot' Profile.